with your OLD e-mail address in the ‘Subject:’ line. I would like to thank all of our readers and contributors. Your input is greatly appreciated and certainly contributes to the success of the newsletter. I wish you all a blessed summer. See you in October. Instead of including a Feature Article, this edition contains an expanded Car Showcase featuring some of our favorite cars. We built two cars in 1996, but they both disappeared. 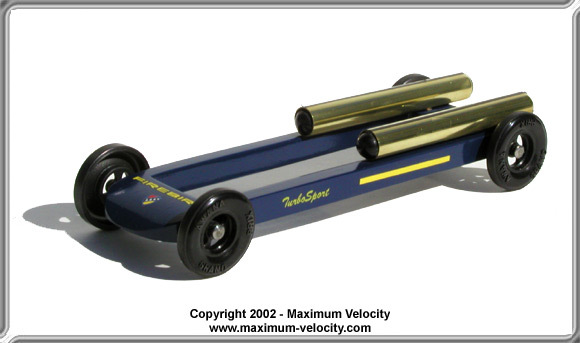 Then in 1997 we built two yellow dragsters. At the time there was a Lego driver in both cars, but by the time I took the photos one had disappeared (maybe he stole the two missing cars!). 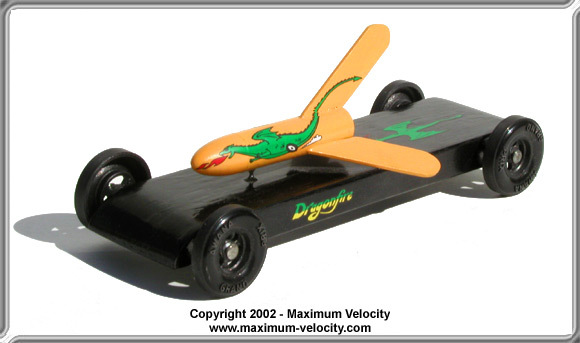 This Yellow Dragster took 2nd Place in speed. This car has an alarm. If you tilt the car, it beeps. This was done with a mercury switch (yes, I know this is taboo – but at the time I didn’t know better). We flipped the switch off after two heats; while it was staged the beeping got really annoying. The car took 1st place for speed and 3rd place for design. 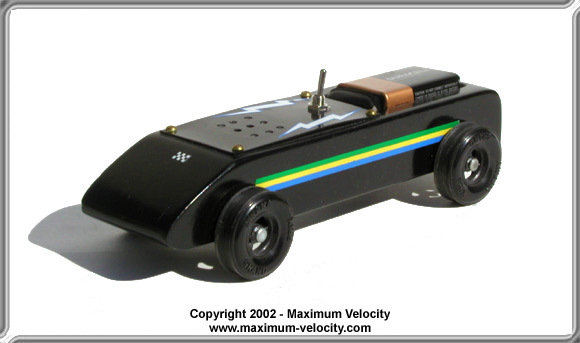 The Battery Car still intrigues kids that come into our shop. This was the first extended wheelbase car we built. At the time another family was building this type of car, so we were trying to catch them. The car took 3rd place for speed. My son wanted a “Rocket Car”, and this was the compromise. The rocket is a tiny Estes rocket. 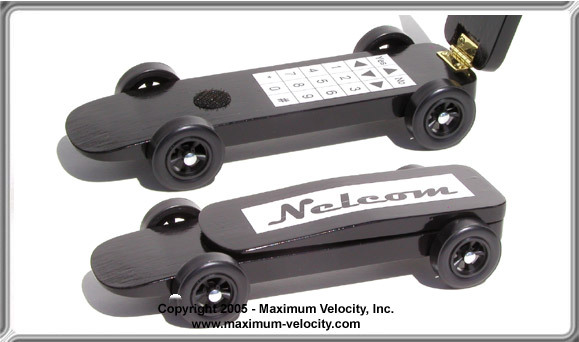 The car took 2nd place for speed, just a few milliseconds behind the 1st place car. At this time Maximum Velocity was in its infancy, and I was writing car plan booklets. The Interceptor was one of those designs – it is in “Advanced Car Plans”. I’m sure I did most of the body work, but my daughter did work on the wheels and axles. The Interceptor took 1st place for speed and 3rd place for design. 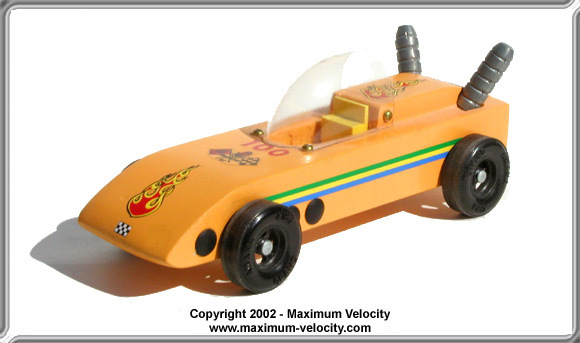 Another Maximum Velocity design (in “Car Plans”), the Speeder is one of my all time favorites. It was inspired by Luke’s speeder in the original Star Wars. It took 2nd place for speed, and 2nd place for design. 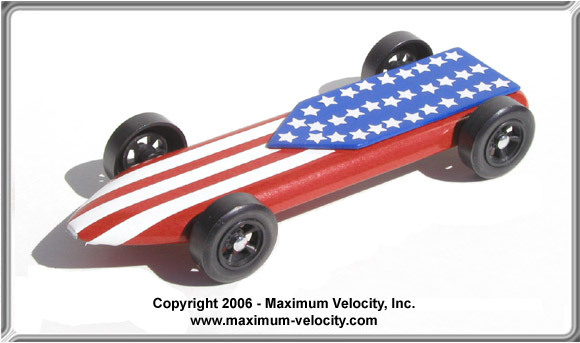 Bill Launius of DerbyWorx was considering offering balsa wood “noses” so that cars could easily have a high nose (an advantage on some tracks). So we built a car with one. It took 2nd place for speed and 1st place for design. My daughter designed this car on her own, and did most of the work. The car took 3rd place for speed and 3rd place for design. The Cell Phone is basically a Wing design with a lid. It was very popular and took 1st place for speed and 1st place for design. 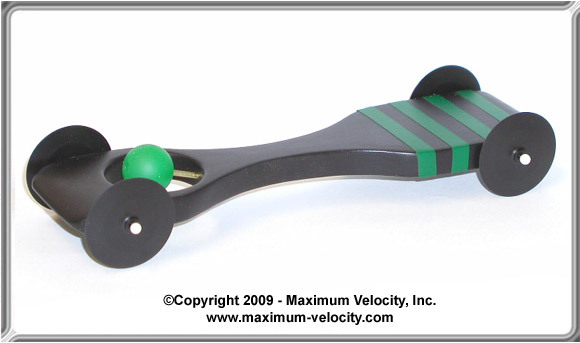 The Stealth is another Maximum Velocity design (Car Plans 5). My daughter spent a lot of time on the artwork. It took 1st place in speed and 2nd place in design. 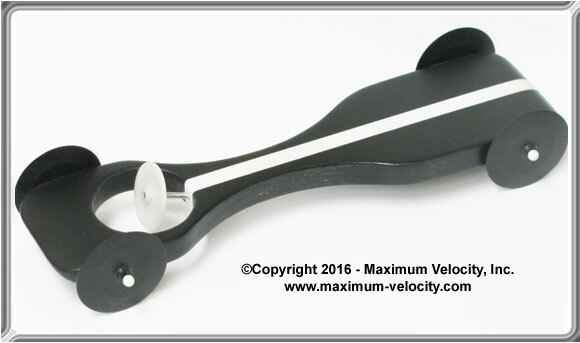 The Velocinator was a prototype of the kit we sold for many years. It was also the first try using needle axles. It was the fastest car, but the needles bent for the final two heats, which was enough to drop it into 3rd place in the Outlaw race (and 2nd place in design). 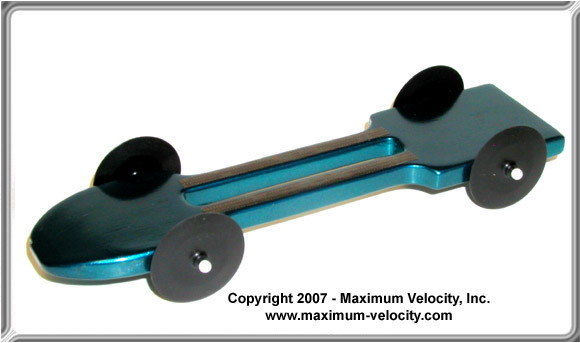 This was the impetus for the creation of the “Needle Axle Upgrade Kit“. This was a try at running on two wheels. The two “outriggers” ride above the track, and are there just to keep in on the track. It ran quite well, taking 2nd place for speed in the Outlaw race, and 1st place for design. 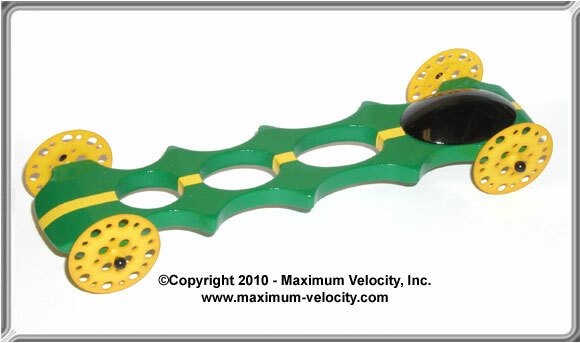 The center weighting kept it from taking 1st place. 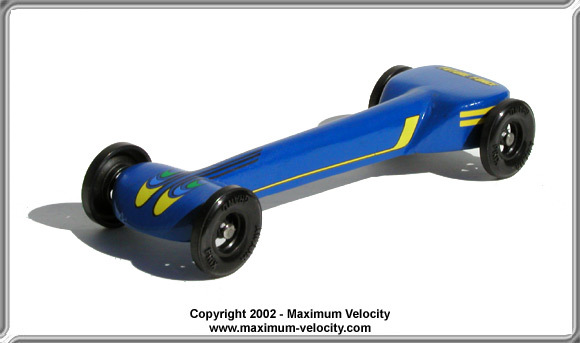 This car was based off the Accelerator design (“Car Plans 6“). We made two of these cars; the second car has a white dish instead of the green sphere. 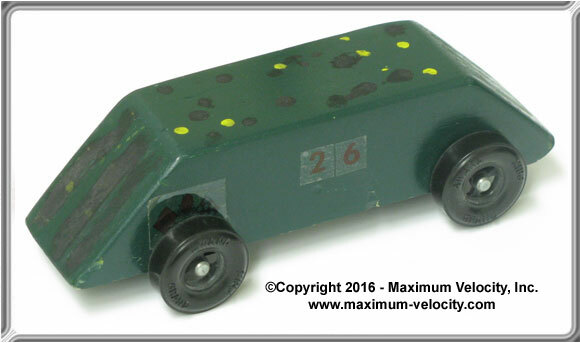 The green sphere car took 1st place in speed in the Outlaw race, and 3rd place in design. 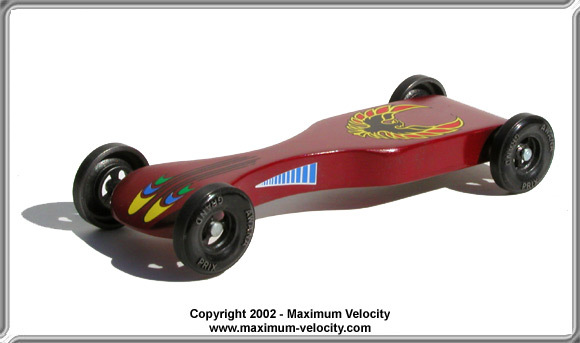 In a later race, the second car was loaned to another adult, and it also took 1st place in speed. This was the prototype of the Vaccinator (“Car Plans 7“). 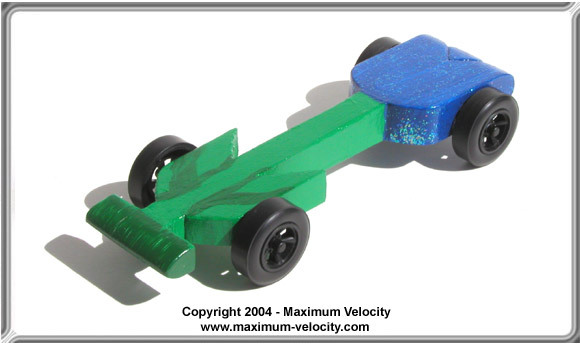 My son Stephen helped design the car. It took 1st place in speed and design. My step-son is in Royal Rangers, and we built a car for their derby race. 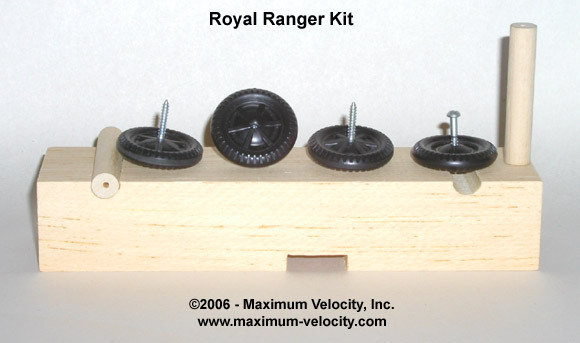 Instead of axle slots cut in the wood block, Royal Ranger cars are equipped with two 3/8 inch dowel rods that are placed in slots on the bottom of the car. The wheels are then attached to the ends of the dowels with screw axles. The night before the race I was making final wheel adjustments. I was having some problems getting the wheels aligned so I lost a lot of the graphite that had been put on the axles. On race day I added some graphite before check-in and was spinning the wheels to get it worked in. I slapped the wheel too hard, knocking the car out of my hands and onto the ground!! Our worst fear … I cracked the front dowel. Luckily the crack was by the wheel that we purposely lifted off the ground. We had to realign the car, and we got it as close as possible. We were expecting that this was going to kill us on the track. But surprisingly, the car performed great, winning the age division race and then taking second place in the finals. We consider ourselves very fortunate that the car performed well. After the race our Pastor joked that dropping the car was the secret. Maybe we’ll have to drop next year’s car as well!? Which wheels are faster: the 4005-MV Speed Wheels or the 4060- Official BSA Pro Ultra Lite Speed Wheels? The two wheels are very similar and both have the same weight. But if you have a choice I would go with the 4005 wheel. Out of the mold, the MV wheels are more accurate than the BSA wheels, and the 4005 wheel is a bit stronger. 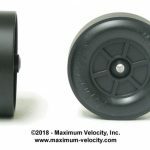 Just make sure that the MV wheels are legal for your race. I had purchased Tungsten cylinders (Item # 5030) from you previously. 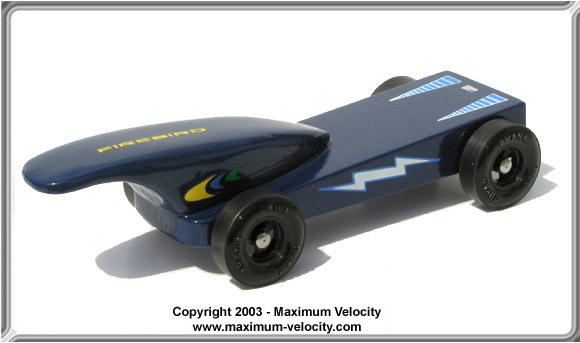 I am interested in the Tungsten Powder now (Item #5064) and would like a better understanding of the volume contained in the 3 ounces, relative to how much space it would require on my pinewood derby car. 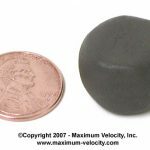 For instance, each 1/2 ounce Tungsten cylinder that I purchased earlier can fit into a 3/8 x 7/16 inch hole I drill into my car. Will 1/2 ounce of Tungsten powder be accommodated in that same hole? 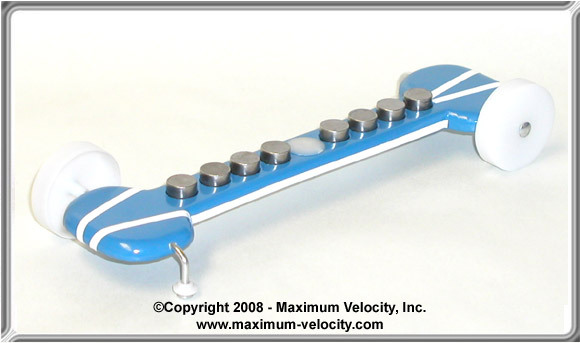 Tungsten powder would take considerably more space than the tungsten cylinders. 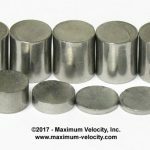 To make cylinders, tungsten powder is compressed into a cylinder shape mold (high pressure), and then is heated in a kiln. The tungsten powder melts and shrinks. So the resulting part is smaller than the mold. So, raw powder takes much more space as it is not compressed or melted. Generally, tungsten powder is used for filling cavities that you can’t get anything else into. Also, some people mix it with epoxy and then use the result to glue in tungsten cubes. This makes the epoxy heavier. Another use is to make castings (domes, drivers, etc). How can I soften tungsten putty and make it a little more sticky? You can try warming it up. Don’t microwave it, but if you can find a warm (100-150 degree) place, it will soften up a little. Maybe on top of a computer or radiator. I think you can also put it in a Ziploc and put that in hot water.